Shah Rukh Khan's most ambitious flick 'Ra.One' has hit the bull's eye! The superhero sci-fic movie reported to have created gigantic and record-breaking single day business (on Thursday) by any film in the history of Indian Cinema and also created new benchmark by surpassing all previous Diwali records (on Wednesday, its first day). According to Eros International Media Ltd (Eros International), 'Ra.One which released on 26th October 2011, garnered a gross collection of Rs. 62.50 crore in its opening two days of Diwali and New Year. The report said - "'Ra.One' grossed Rs. 26.5 crore with a net of Rs. 18.5 crore on Wednesday 26th October making it the highest ever Diwali day collection in the history of Indian cinema. The second day collections on Thursday 27th October were even more impressive with the film raking in Rs. 36 crore gross with a net of Rs. 25.10 crore making it the highest collection ever on a single day for an Indian film. Also in the overseas market, the film has shown magnificent performance being the highest collections for any Indian film so far." Produced by Red Chillies Entertainments, 'Ra.One' also stars Kareena Kapoor and Arjun Rampal in lead along with Armaan Verma, Shahana Goswami, Dalip Tahil, Satish Shah and others. Commenting on the stupendous opening, Nandu Ahuja, Sr. VP, Distribution, Eros International Media Ltd said, "We are witnessing unparalleled collections across the country with record breaking figures from different territories. Business usually gets hampered on Diwali day in the evening due to Laxmi pooja, despite which Ra.One has performed exceptionally well across the country and has proved to be the biggest ever Diwali day release. The film has opened at 95 to 100% collections from most territories and is a sure sign of one of the biggest blockbusters in the making in Bollywood. The second day figures have also broken records for the highest collections for a single day for an Indian film." Kamal Jain, Group CFO, Eros International Media Ltd added, "Majority of the film's costs have been recovered before the film hit theatres and the box office numbers are exemplary giving major boost to profitability. We are extremely happy with the box office performance of the film as the same is very much in line with our expectations." 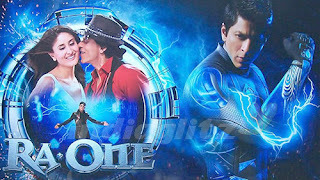 Releasing over the extended festive weekend, 'Ra.One' opened across more than 4,000 plus screens worldwide (3,100 plus screens in India and 904 prints internationally, including 3D, Tamil and Telugu) to rave responses and continues to draw in record numbers released across.